So, so cute! 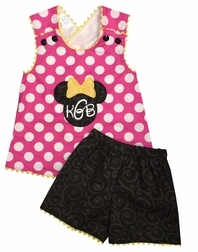 This is one of our favorite Minnie Mouse outfits. 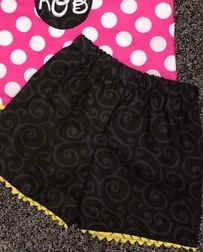 It is identical to our red with white dots version BUT we use hot pink with white dots and accent it with tonal black on black swirls fabric! We start the outfit with the hot pink fabric and fashion a criss cross back swing top trimmed with yellow ric rac. The top is paired with the black tonal shorts which are also trimmed in the ric rac. 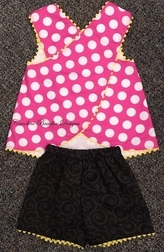 The top is appliqued with a black swirls fabric Minnie head with a yellow outline bow made with yellow and white swirly stripe fabric we use in our red version of this outfit. The yellow bow accents the yellow ric rac to give the outfit a "pop". 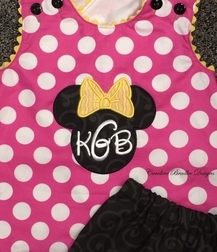 You can also choose to have your little one's name or 3 initials monogrammed in white Disney font inside Minnie's head.